This did not inspire much confidence, particularly in light of previous suggestions that Trump wasn’t studying for his sit-down with Kim. It turns out Trump was right, in a way. 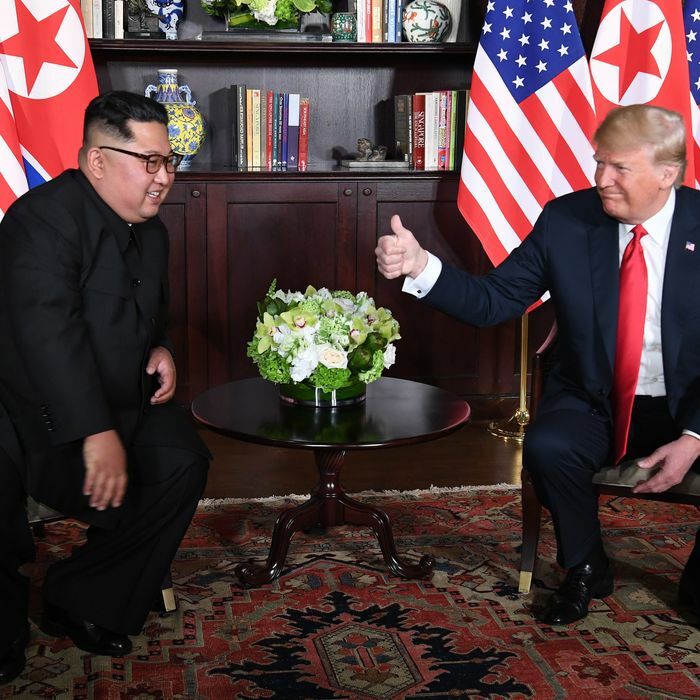 The summit was so light on substance that it probably didn’t require detailed knowledge of North Korea’s nuclear-weapons program, and the key outcomes were apparent by the time the two leaders completed their first one-on-one conversation. Here’s an early look at who benefitted from the meeting, and who’s worse off. The visuals — from the massed banks of U.S. and North Korean flags to shots of the two leaders chatting amicably — were everything the North could have wanted, and probably more than the kidnapped film directors who made Pyongyang’s propaganda movies for years would have dared imagine. North Koreans have been told that they sacrificed material well-being for decades to get weapons that would earn them the respect of a world that has treated them as illegitimate. These pictures will seem to confirm that story. Also, the images of Kim Jong-un touring Singapore and arriving early to the summit venue to show respect to the elder Trump will play in marked contrast to a cartoon circulating on Chinese social media, showing a diplomatic table, with one high chair for the United States. Many conservative defense intellectuals who served in previous administrations joined their liberal colleagues in fretting over whether Trump could actually get the North to take concrete steps toward denuclearization. However, few called on Congress to take even the most minimal steps to put pressure on the president — for instance, backing the bipartisan bill that would require the Trump administration to brief lawmakers on negotiations with North Korea. As long as his own party is not willing to challenge the summit outcome in any way, Trump has endless freedom of action; he can plan further meetings, stall the process, or blow up negotiations altogether with one midair tweet. The idea that anything positive could come out of this session is a hard pill for Trump’s opponents on the left and right to swallow. But how quickly we forget. Just four months ago, the two regimes had egged each other on to the point that a range of voices in Washington were musing about launching a preventive war — and observers feared that momentum couldn’t be stopped. Yes, it’s a ridiculous waste of U.S. attention and resources to spend a year ratcheting up a confrontation and then four months ratcheting it down. Yet here we are. A cynic would expect to see that cycle repeated as long as it brings all sides good ratings. Let’s also give Trump’s improvisational, personality-based approach its due. It makes great TV, which is what it’s intended for. But every tool the international community has to prevent war, grow economies, and safeguard the vulnerable is premised on structures, commitments, reliability, and patience. There’s a reason for that: in the past century, the personalized leadership style Trump and Kim represent has dragged the world into two cataclysmic wars, and to the brink of nuclear annihilation. Before the summit, administration sources said Trump had decided not to mention Kim’s horrific record on human rights. It appears he was true to his word. Though Trump promised during the last State of the Union to honor the memory of Otto Warmbier, the American student who died shortly after being returned from North Korean custody, he was silent when asked about him in front of Kim. When pressed on this during a solo press conference, Trump made the dubious claim that the summit wouldn’t have happened if it weren’t for Warmbier — but only after offering more praise for the leadership skills of the man responsible for his death. It’s the perfect encapsulation of the Trump administration’s false bravado. This is an America that uses a misogynist slur to cast the rest of the world as weak and acted-upon. It’s also an America that proudly sits down with the leader of a murderous regime; says nothing about the suffering of the North Korean people; and seems content to come away with no concrete road map to address the nuclear weapons that threaten our nation and our allies. Doesn’t seem that tough, does it?